The combined experience of our management team encompasses over 75 years of real estate development and marketing expertise. Our leaders are involved in every aspect of the development and construction process, from project origination to financing, management, and sales and marketing. Together, they are responsible for the commercial success and profitability of one of the country�s most capable real estate development groups. Mr. Lang has guided Pinnacle Development Group through its most ambitious projects, and his leadership has seen our most dramatic periods of growth. This includes the $150 million Estancia, Pinnacle Development Group�s premier residential community and country club whose golf course was selected by Golf Digest as �the best new private course in America.� Prior to forming Pinnacle Development Group, Mr. Lang served as president of Dixons Arizona Properties, a subsidiary of the Dixons Group, PLC, a publicly traded $4.3 billion international retail firm based in London. As president, Mr. Lang was the driving force behind the highly successful $62 million Racquet Club at Scottsdale Ranch. He has been involved in real estate projects in Florida, Texas, California, Hawaii, Arizona, and Salzburg, Austria. He has also established an impressive reputation as a real estate marketing expert, providing market analysis and specialized sales strategies for a number of noted companies including Costain, Florida, The Industrial Bank of Japan, US Lend Lease, Sydney, Australia, and Siemans Corporation USA, Boca Raton, Florida. 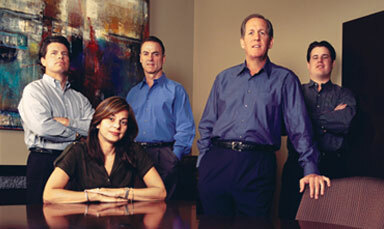 As CFO, Mr. Grady is directly responsible for the commercial viability of Pinnacle Development Group. He directs the company�s financial planning and property acquisitions, and he is its chief architect for structuring loans, tax deference strategies and cost-savings programs. His strong financial leadership was the driving force behind the visionary economic model for Estancia, making possible our landmark achievement. Before co-founding Pinnacle Development Group, Mr. Grady was member of the Big-8 public accounting firm, Coopers and Lybrand, practicing in their Phoenix banking and real estate division. Additionally, Mr. Grady was a licensed securities representative, certified public accountant, vice president and member of the due diligence committee for Young, Smith and Peacock, Inc. His leadership proved invaluable as one of the primary shareholders establishing the initial financing of the Fairway Land Company, original developer of the famed Marbella Golf and Country Club in San Juan Capistrano, California. Mr. Boyd brings over 25 years of real estate industry experience to his duties as project manager for The Ranch at Santa Paula, Pinnacle Development Group�s 4,800-acre development in Ventura County, California. He oversaw its conceptual planning, and still manages the processes involved with its development. Before joining Pinnacle Development Group, Mr. Boyd specialized in industrial and investment property sales and leasing with Coldwell Banker Commercial Brokerage. As vice president and director of sales and acquisitions for Aries Enterprises, Ltd., of Tucson, he directed the marketing efforts of the Hughes Estate portfolio. Mr. Boyd was co-founder of The Land Group, a specialty management company providing brokerage, financial and asset management services to owners of large land parcels, developers and homebuilders for master-planned communities. Mr. Lang is responsible for ensuring the business efficiency of Pinnacle Development Group by coordinating project systems and Web development through all areas of project and construction management. He produces the marketing and presentation materials required for property acquisition, development and sales, and he oversees all maintenance, telecom and operational needs of Pinnacle Development Group�s corporate office. He is a graduate of the University of Arizona�s Department of Economics, and he brings a highly developed business and technical sensibility to bear on his duties as director of business development. Ms. Vincent coordinates the executive team through the acquisition, purchase and management procedures of every Pinnacle Development Group project. She monitors the progress of each property development, provides up-to-date status reports on a weekly basis, and directs administrative tasks as necessary. Fluent in four languages and conversant in the many disciplines of land development, Ms. Vincent has compiled an impressive résumé of achievement with respected construction management and real estate firms that include Peck/Jones Construction, Huntcor Corporation and Burnham Pacific Properties. Prior to joining Pinnacle Development Group, Ms. Vincent worked as director of telecommunications for Greens.com, a successful Internet start-up company, and she played a pivotal support role in the sales and marketing efforts for the World Cup U.S.A. 1994.